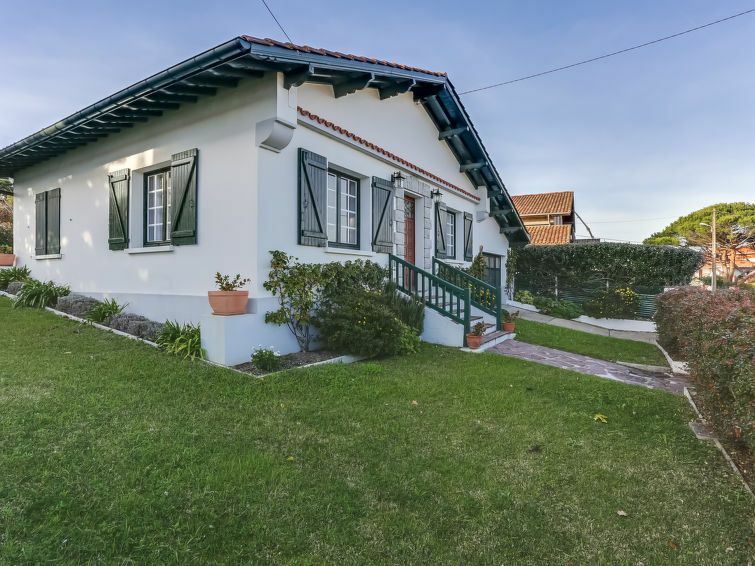 Saint Jean de Luz: Single-family house "this property". Residential area (villas), 1 km from the sea, 1 km from the beach. Public parking on the road. Shop 2 km, grocery 2 km, restaurant 1 km, bakery 2 km, café 2 km, 25 minute walk to the centre, sandy beach "Erromardie" 1 km. Sports harbour 3 km. Nearby attractions: Jardin Botanique 800 m, Pointe de Sainte-Barbe 1 km, Baie de Saint Jean de Luz 2 km, Parc Ducontenia 2 km, Ecole de Surf/Paddle 2 km, Club de plongée 5 km. Hiking paths: La Rhune 14 km. The keys‘ handover takes place by the agency Interhome in Saint Jean de Luz, 2 km. 3-room house 90 m2. Comfortable and beautiful furnishings: living/dining room with 1 sofabed and TV (flat screen). 1 room with 1 bed (160 cm), TV (flat screen). 1 room with 1 bed (160 cm), TV (flat screen). Open kitchen (4 hot plates, oven, dishwasher, microwave, freezer). Shower, sep. WC. Gas heating. Garden 500 m2. Terrace furniture, barbecue, deck chairs (4). Facilities: washing machine, iron, hair dryer. Internet (WiFi, free). Please note: smoke alarm.